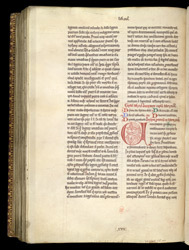 Book XVI ends half-way down the right-hand column; it is followed by a rubric, a list of chapters on Book XVII, and Book XVII itself, starting with a fine initial red foliate 'U'. In the middle of the lower margin is the roman numeral XVII, a quire number indicating that this is the last leaf of the 17th quire. Below this, and partly cropped, are two inscriptions in smaller, less formal script: these were written by the main scribe as guides to the rubricator.